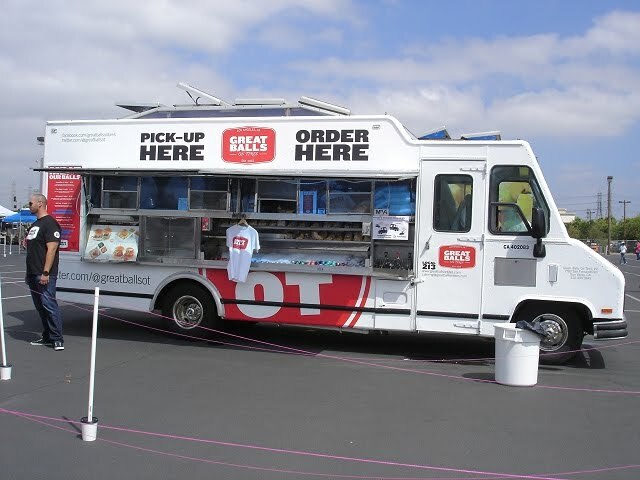 You have heard of the New Food Truck craze going on in the Streets of Los Angeles. You will experience 11 upfront interviews with the creative chefs and the owners behind the Gourmet Food Trucks at the OC Foodie Fest on August 28th 2010 at the Honda Center in Anaheim Ca. 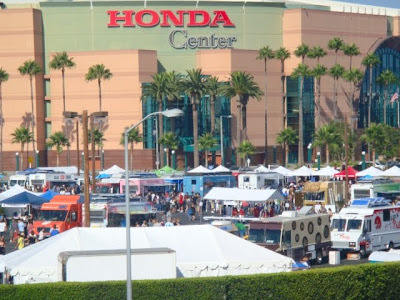 The venue was completely sold out with 8500 in attendance to 49 of the hottest and popular Gourmet Food Trucks in California. A percentage of the proceeds did benefit three local charities - Child SHARE, Pretend City , and St.Vincent's Meals on Wheels. We will take you behind the scenes with the three trucks that were chosen for Yelp's "Best of the Fest" Food Truck Award. 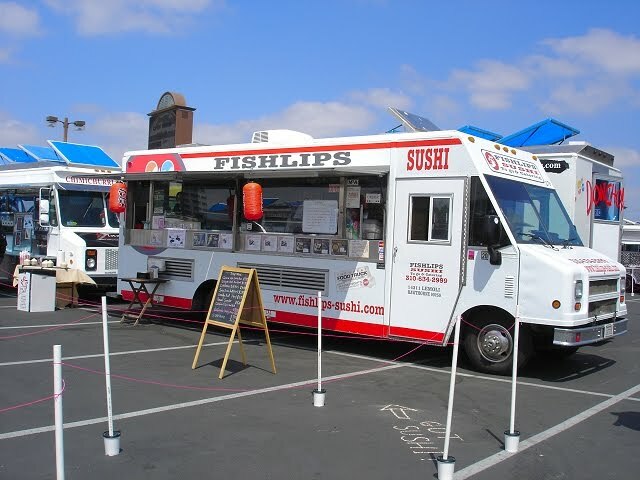 This award was selected by Patrons who attended the OC Foodie Fest and were able to vote for their favorite Gourmet Food Truck. 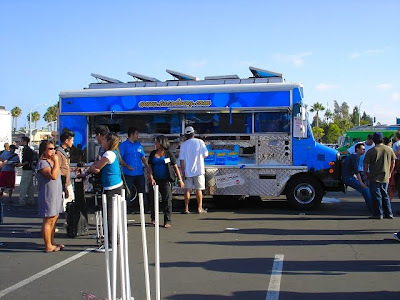 The winners were OC's The Lime Truck with first place, OC/LA's Chunk-n-Chip Truck was second place and LA's Great Balls On Tires Truck took third place out of 49 food trucks that attended the OC Foodie Fest. A venue of this size takes a lot of planning. I would be amiss if I did not take a moment to mention some of the star players that made this event happen. 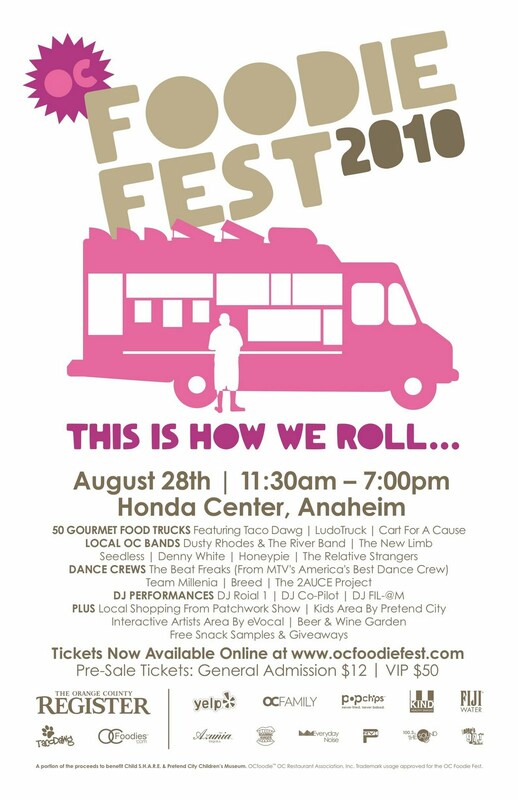 Ashley "Ash" Eliot who is the PR MGR for OC Foodie Fest, Virgina Strickland the OC Foodie Fest Co Producer, Co Producer James "Fox" Foxall Aka Taco Dawg, all the OC Foodie Volunteers, Artisans and Vendors, Jade in the VIP area, Anaheim Police, and the Honda Center Event Staff. 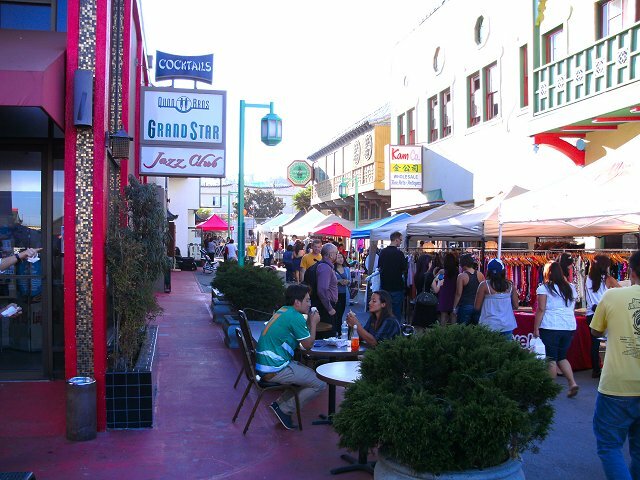 Enjoy a lil look at the OC Foodie fest before opening. Now onto the Video interviews of the 11 selected Gourmet Food Trucks at the OC Foodie Fest. Time to get up and personal. There were many selections to choose, raging from savory to sweet and even bizarre flavors. I would like to take a moment to share my OC Foodie Fest food adventure with you. My first stop was the Dumpling Station owned by Helen Pan and Chris Aragon who took the time to discuss the building of their successful Taiwanese Gourmet Food Truck. 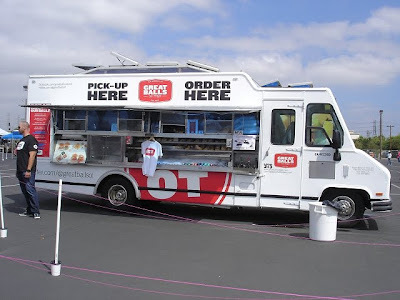 I have eaten at this gourmet food truck many times. Their Food is always consistently great, they provided good customer service by answering their tweets timely, and update there locations timely. Enjoy their video interview and food Pics below. 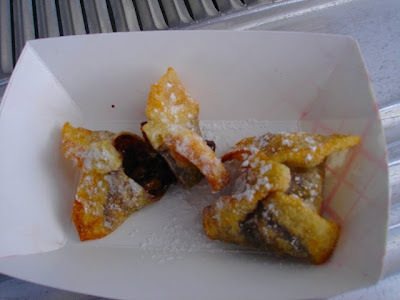 Nutella stuffed fried wonton was simply scrumptious! 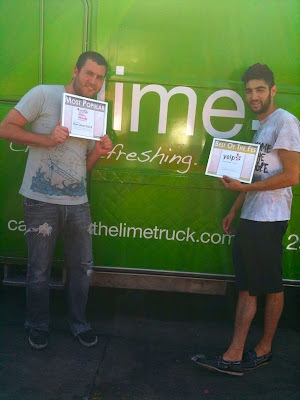 We met up with Chef Jason Quinn and Business Partner/Sous-Chef Daniel Shemtob at the OC's The Lime Truck. 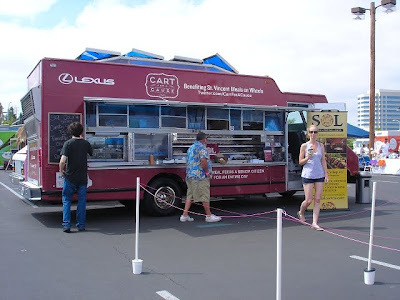 They were the only truck serving Foie Gras Mousse on a Crostini. Yes you read that right! 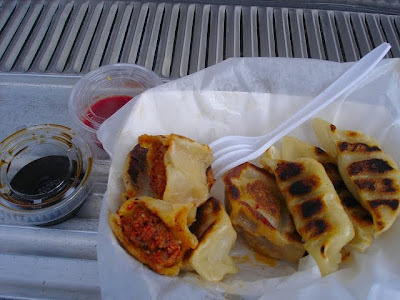 from a food truck. 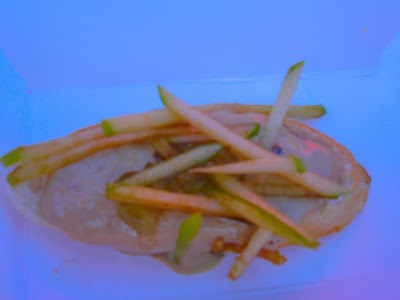 It was very smooth and rich finished off with Apple Sticks on top a crunchy crostini, Delish! 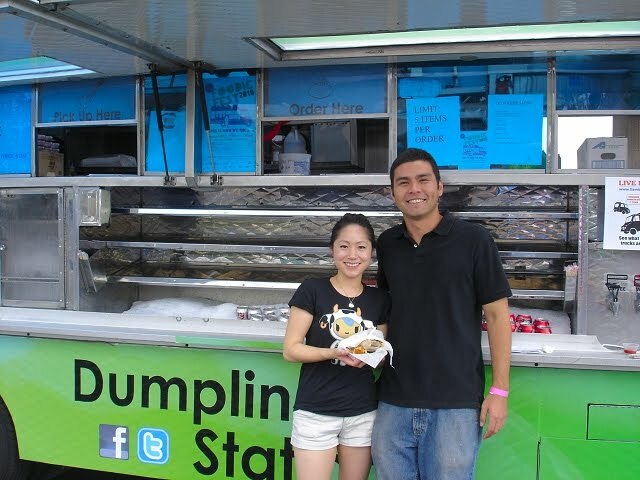 They also were selected as Yelp's 1st place winner for Best of the Fest at the foodie fest by the 8500 attendees that voted for their favorite food trucks. See photos and video interview below. Seafood Ceviche-Refreshing and well balanced flavor. Foie Gras Mousse with Apple Sticks on a Crostini- Rich and decadent. 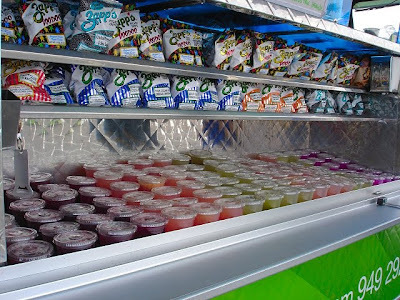 Housemade Drinks from Catus Pear to Pluot (complex cross hybrid of plum and apricot) Limeade. Refreshing on a hot day. The Money Shot Yelp's 1st Place for Best of the Fest Food Truck and Most Popular Truck Award.Great Job! 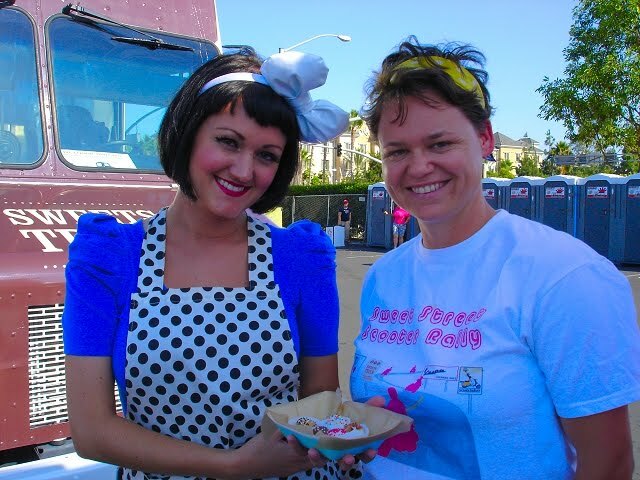 Here is Molly Taylor (On the Right) Owner of The Sweets Truck, a Mobile Cafe debuting the new Jenny Rae (on the Left) Lil Rae Cakes, which BTW are Awesome! Loved the Maple Bacon and Red Velvet Lil Rae Cakes that we tasted. We have eaten from The Sweets Truck many times, due to the quality of her products such as; Cake Monkey, Coffee drinks, and now Lil Rae Cakes. Molly demonstrates great customer service by following up with tweets, emails, special requests, and makes you feel like your part of her family when you come by to chat or buy. Nice to have a such a SWEET friend. 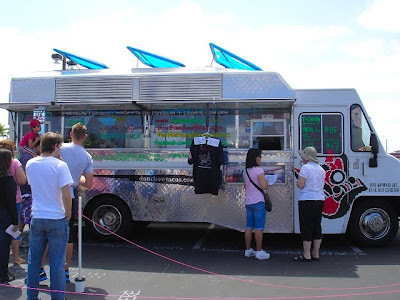 There is a Special Video that was captured see what happens when you take an enthusiastic food truck owner and mix in some Sugary sweets. Enjoy!!!! After trying some of the Sweets Truck's goodies, this is what you do! 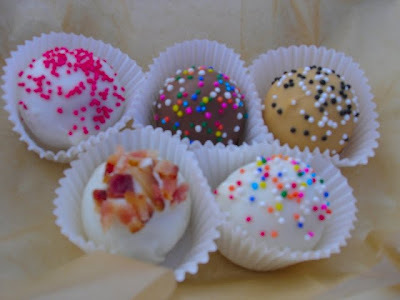 Maple and Bacon-White (Bacon Strips) , Red Velvet-white (Red Sprinkles), Peanut Butter and Chocolate-Tan (Black and White Sprinkles), Vanilla-White (Multi-Colored Sprinkles), Chocolate-Dark Brown (Multi-Colored Sprinkles). 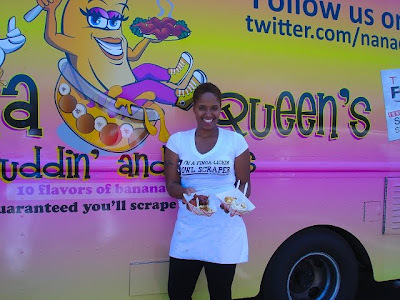 The lovely lady holding one of the best banana pudding and wings is non other than the famous Nana Queen, Janel Prator. I have heard about the pudding, but I will tell you this gal can throw down some wing sauce too. I tried the Original Banana Pudding, oh man its was off the hook and then the Carmel Banana Pudding was equally as great! The pudding was sweet and creamy like a nice custard with a hint of vanilla and of course banana. The Wings were nicely cooked and the wing sauce was tangy and well balanced, I was not up for sharing! =) The potatoes reminded me of a deconstructed delicious potato skin but without the skin. Janel had impressed me one night regarding customer service, when she twitted to her customers "NanaQueens We apologize. 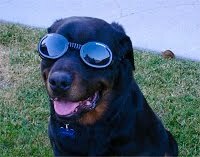 We always try 2 inform of r location changes thru twts. Plse feel free 2 stp by nxt tim & we will giv u a discount on ur order 7:37 PM Aug 17th via Twitter for BlackBerry®." This is an important thing to remember when in business, is customer service, without customers you have no business! Great Job Janel and Great Food! Enjoy their video interview below. 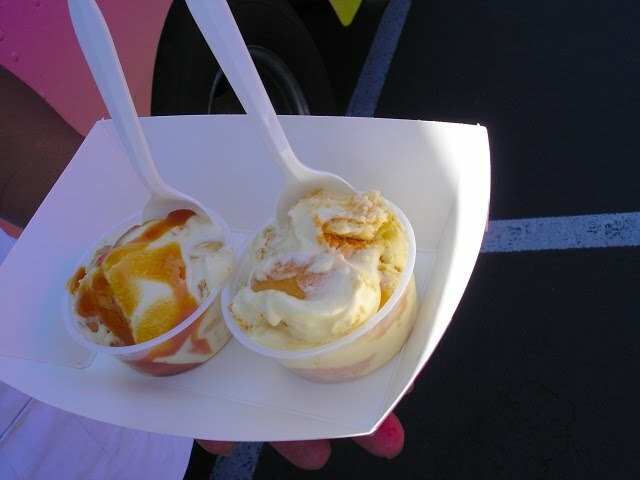 Banana Pudding with Carmel (on the Left) Banana Pudding Original (on the Right)-Delish! 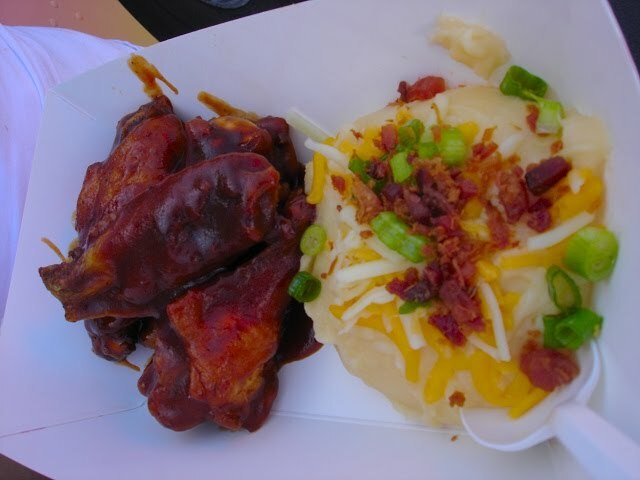 BBQ Mango Wings was nice and tangy with a side of Taters-Yummy! 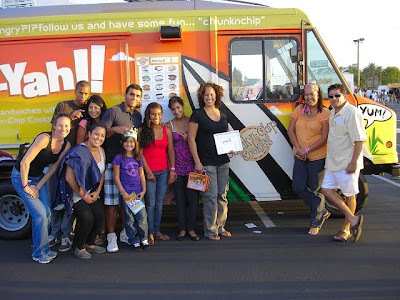 This was the first debut of the Chunk n Chip Ice Cream sammie Truck. Owner Claudia Gonzalez says that her product is an artisanal cookie ice cream sandwich roaming boutique. I will tell you that they're amazing! 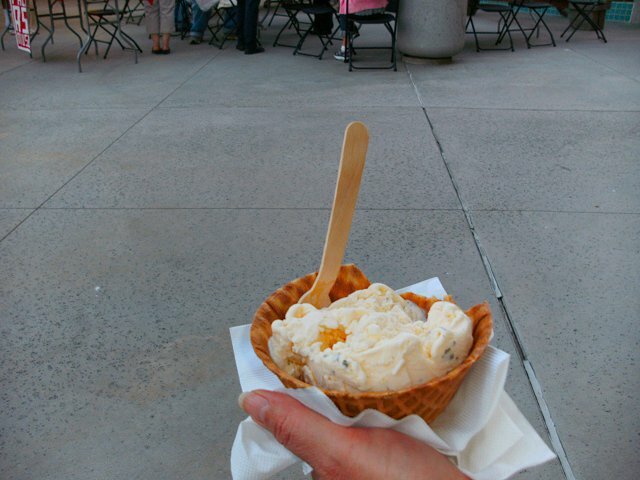 All of the cookies we sampled were big, soft and well balanced in flavor with a creamy homemade ice cream center. 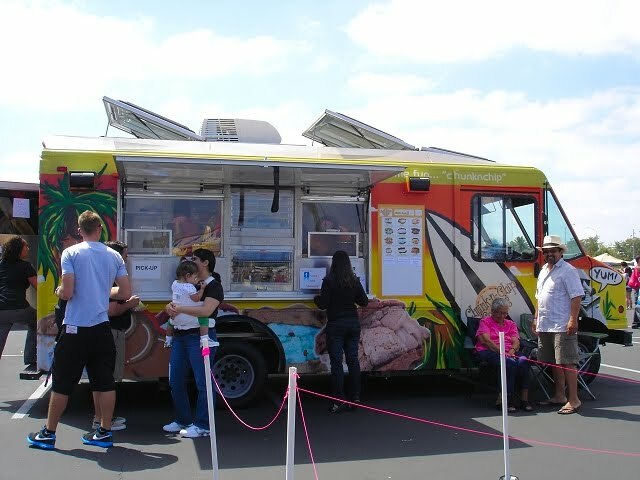 They were the only Ice cream truck to win the coveted Yelp's 2nd place Best of the Fest award out of 49 gourmet trucks selected by 8500 attendees, not bad for a new food truck debut. Watch for them on the streets of OC/South Bay/LA near you. Ice Cream Sammies as you know it will never be the same! Enjoy their video interview below. Owner Claudia G sharing her samples of Moo-lan Rouge-Sweet soft Red Velvet cookie with smooth creamy White Coco Fudge-Decadent, Goober Doober-a Mix of Chocolate Chip upper and Chocolate Brownie soft and sweet cookie with a smooth and creamy Mint Chip and Vanilla Bean ice cream-Amazing!, and Mumbo Jumbo- Creamy Peanut-Butter ice cream Surrounded by a soft and sweet Chocolate Brownie cookie-Off the hook. These are the most incredible Sammies out there. The award speaks for itself! 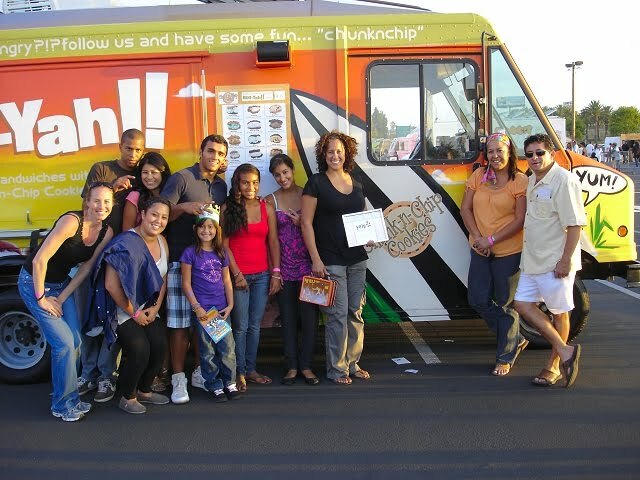 The Family and the Chunk N Chip Crew Enjoying their 2nd place Yelp Award for the Best of the Fest gourmet food truck. 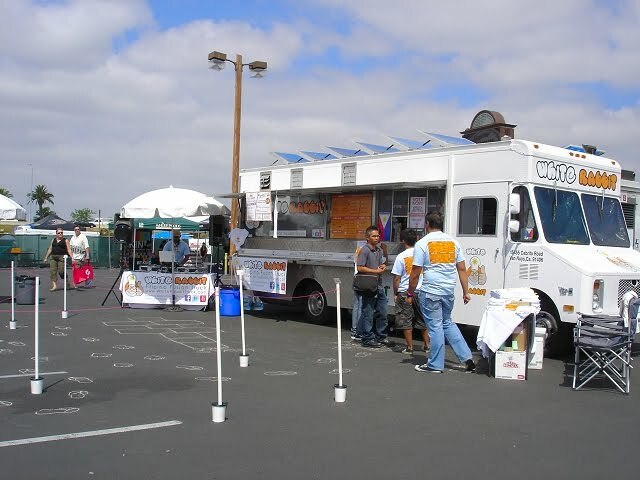 The only ice cream truck to receive this award. Great Job! 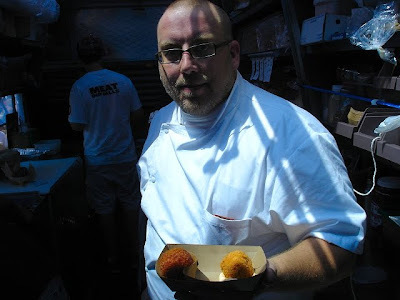 I met the Great Balls on Tires crew Aka GBOT back in July at the Long Beach Street Food Fest. Michael Brombart pictured above in the background to the left is one of the owners of the GBOT team. Mike is an important part of what makes GBOT so successful along with Partner in crime Clint Peralta. There is a new World Class baller you will meet during the exclusive interview with GBOT. The GBOT crew won the coveted Yelp's 3rd place Best of the Fest award out of 49 gourmet trucks selected by 8500 attendees at the OC Foodie Fest. We sampled the new inspired incredaBall with a new smokey flavor and the OC inspired OC Foodie Fest ball, a mix of savory, a risotto orange colored well balanced flavored ball with smooth creamy mozzarella oozing out at first bite with a side of Sweet, orange flavored flakes surrounded a creamy semi sweet cheese cake ball was Ballicious! Amazing Job GBOT Crew! 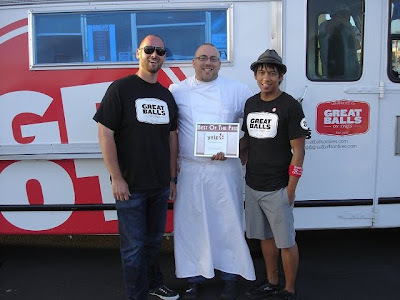 New World Class Baller Chef Michael David joins GBOT with OC inspired ball package. Amazing! Chef Michael David's newly inspired Incrediball-Smokilicious Perfection. The GBOT Crew enjoying their Yelp's 3rd place Best of the Fest Award. Great Job! Check Out page 2 of the OC Foodie Fest last 5 Gourmet Truck interviews! 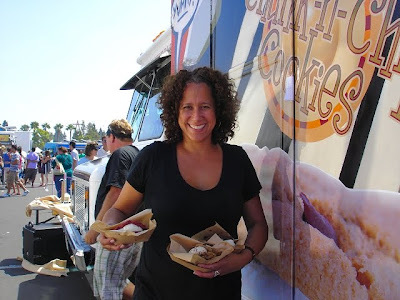 You will probably recognize this lovely lady from the 5th season of the "Next Food Network Star." Debbie Lee had gone far in the competition and its no fluke that she has opened a popular gourmet food truck named Ahn-Joo (Korean snack bar on wheels) serving up the finest in Korean pub grub. We were able to sample some of Debbie's great food at the OC Foodie Fest such as; the Korean Fried Chicken, Nice crunch with a well seasoned balance of Garlic and Soy and Debbie's Korean Nachos, that had a nice texture with a pleasant amount of heat and braised pork meat ! Yeah!!! 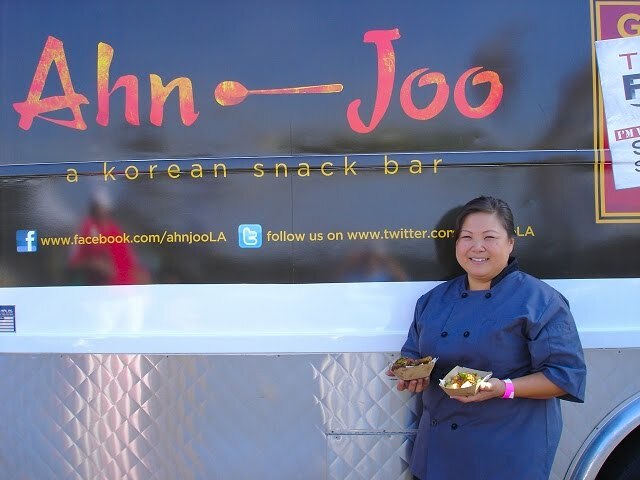 Expect a new announcement coming soon from Debbie Lee as she opens her first Brick and Mortar Korean drinking house. Enjoy the video Interview. 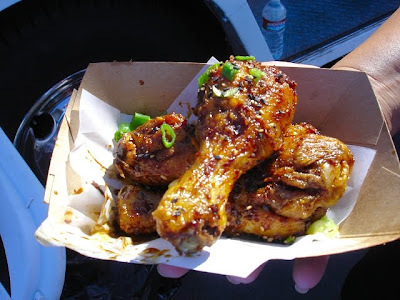 Korean Fried Chicken Twice fried with a well balanced Soy-Garlic glaze-Awesome! 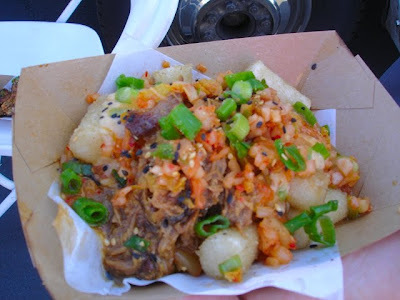 Korean Nachos made with duk bok gi (Korean Rice Ovaletts), four varieties of cheese, braised pork, and kimchi salsa-Nice Texture with a salty Oowe Gooew deliciousness-Wonderfully yummy. 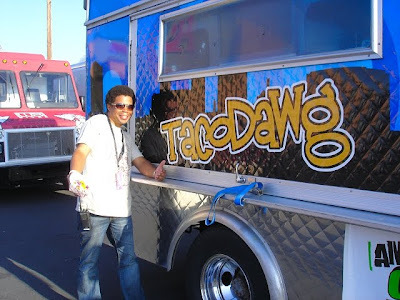 The Don Chow Taco Truck offers a unique Fusion of Chino meets Latino as said by Owners Dominic Lau and Lawrence Lig pictured below. 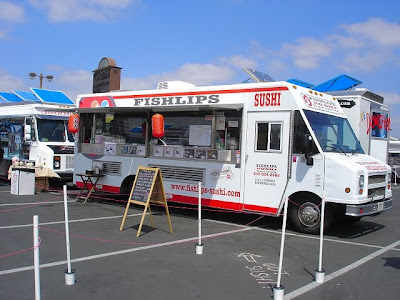 I have tasted different items from this gourmet food truck prior to this foodie event and their Food has tasted great, they follow up with their customers and love to mix it up with the crowd. 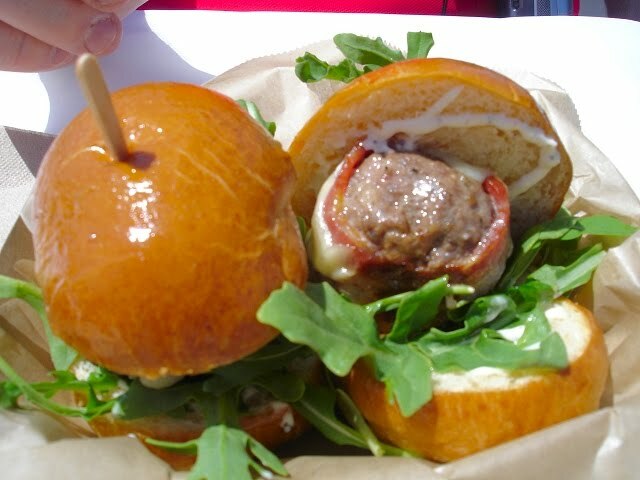 We tried their sampler menu for the OC Foodie Fest event that was simply amazing. Owners Dominic Lau (on the Left) and Lawrence Lig (on the Right) with Sampler. Sampler Platter included a Kung Pao Chicken,Chinese BBQ Pork, and Pork, Bacon and Caramelized Onion Tacos that were incredible. This exotic gourmet food truck takes food to a new level , can you say fresh sushi, Hmm off a food truck. 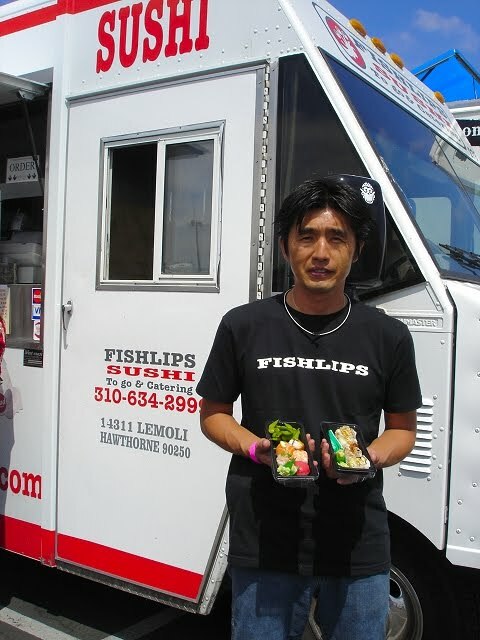 I have been to this gourmet food truck called Fishlips Sushi a few times, but today we tried the Temari Sushi-(Kyoto-style) is a ball-shaped sushi made by pressing rice and fresh fish together and their Dragon Roll, which is pictured below with Takeshi Kimura (chef/owner). I just call him "TK." 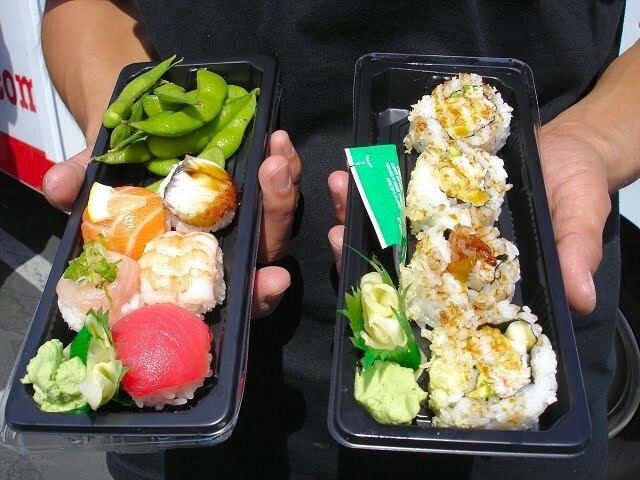 Takeshi Kimura (chef/owner)-TK with holding Temari Sushi and a Dragon Roll. 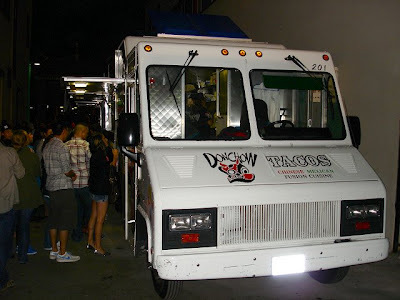 I met the White Rabbit Truck Crew back in July at the Minx that was celebrating the Champion Lakers hosted by former laker teammate Jordan Farmar. 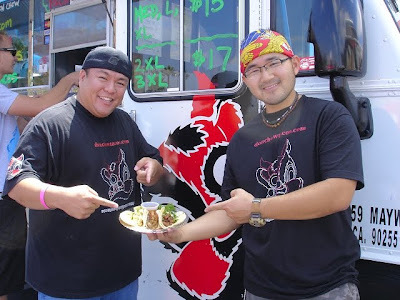 The White Rabbit Owners I met are Melvin Chua, James Du, and Michael Dimaguila who said their food is a fusion of the foods they grew up on from their Filipino background mixed with a hint of the best from there American and Mexican flavors they enjoyed. 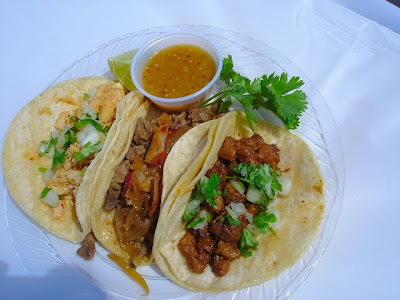 We tried their Beefsteak tacos that are marinated in citrus juices and slow cooked until tender along with their Pork and Shrimp Lumpias. 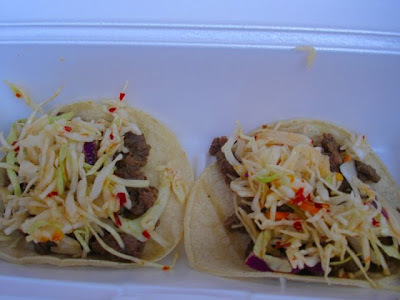 Beefsteak,citrus marinated steak with creamy tangy Asian inspired crunchy slaw in a soft delicious taco. Loved it! 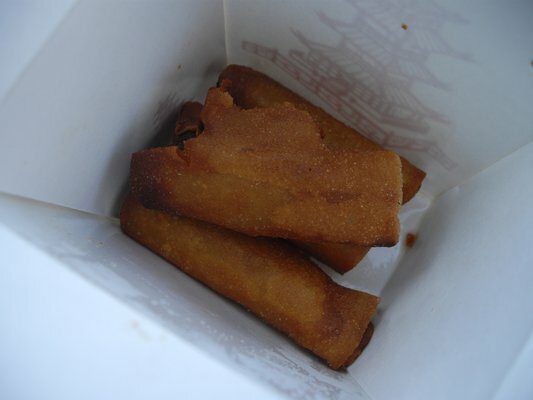 Lumpia (Pork and Shrimp)- Crunchy and nicely spiced salty pork with soft and tender shrimp season to perfection. Owner of Taco Dawg/Co Producer OC Foodie Fest James "Fox" Foxall. 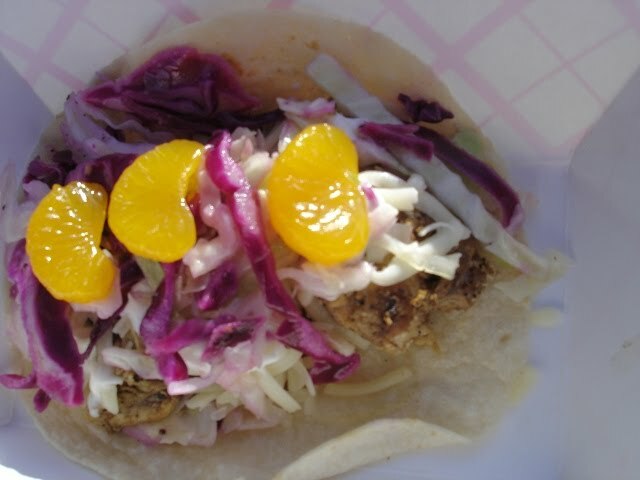 Beach Comber, Chicken with a chipotle cream sauce, Taco Dawg's own cheese blend, citrus blend slaw, served with Mandarin Oranges for a sweet taco with a hint of heat. A hit at the fest amongst the crowd. 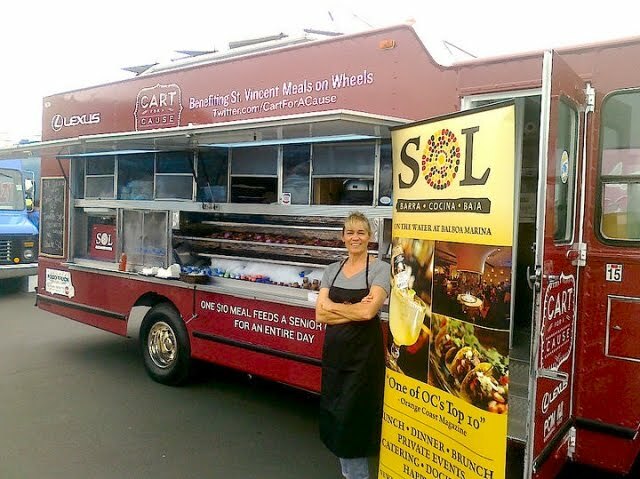 Chef Deborah Schneider's of Sol Cocina was hard at work in the Cart for A CauseTruck at the OC Foodie Fest. 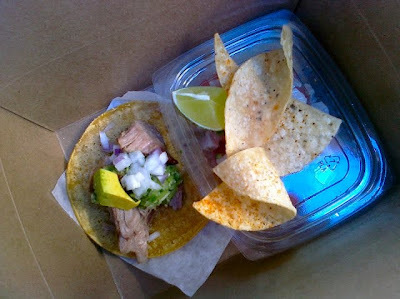 Chef Deborah not only gave her time, she supplied the food, and knocked down the normal $10 price to $5 for carnitas taco with chicharrón on a lovely soft corn tortilla, a generous portion of ceviche with chips really made it worth it. Great Job Deborah!! The Cart for A CauseTruck raised enough money to feed more than 300 people for St.Vincent's Meals on Wheels charity. Also, the Child SHARE and Pretend City charities received $10,000.00 from the proceeds of the OC Foodie Fest. Great Job! Carnitas taco with chicharrón on a lovely soft corn tortilla, a generous portion of ceviche with chips. 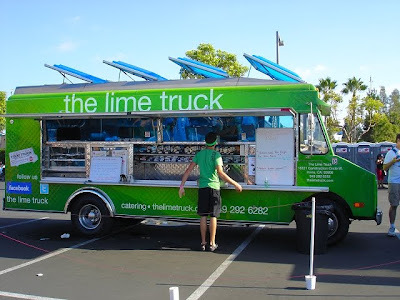 and a lime slice. OLE! 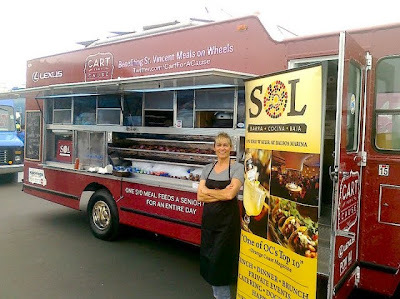 My pick for the Robin Hood of the OC Foodie Fest is Chef Deborah Schneider's of Sol Cocina who was hard at work in the Cart for A Cause Truck at the OC Foodie Fest. Chef Deborah not only gave her time, she supplied the food too. Way to go Deborah! 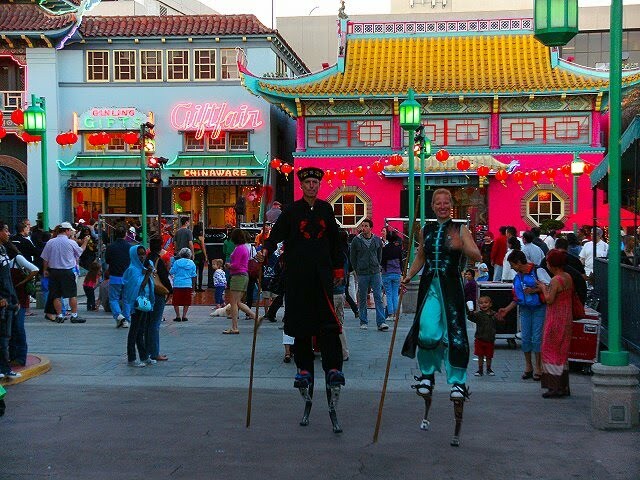 Wow what a delightful time at Chinatown Summer Nights today. I met up with one of the organizers Aaron Paley (http://www.carsla.net) who graciously showed us around with providing interesting history tidbits of how the land is Chinese owned since 1930 when it was purchased. 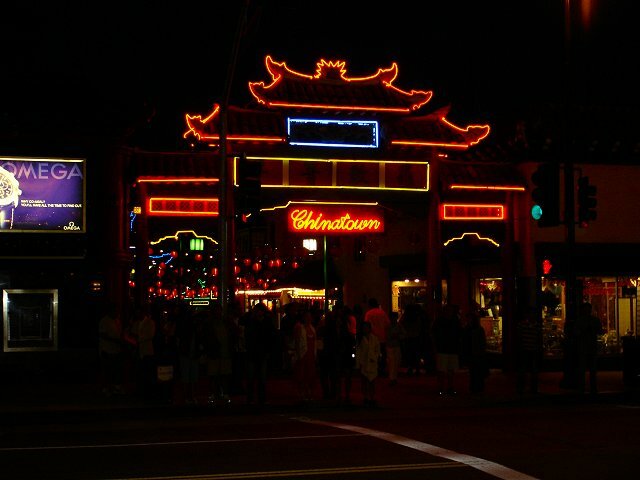 The current Chinatown is the only Chinatown that is owned and built by Chinese people in the United States. Some popular movies such as; Rush Hour with Jackie Chan has been filmed there. The original Chinatown was actually 1 mile away from its original location where Union Station is now located. 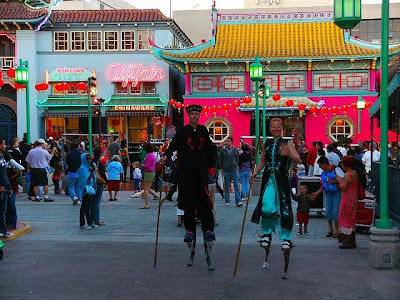 The Chinatown that was originally designed by Hollywood film set designers as a "Chinese" movie prop and donated by the legendary film director Cecil B. DeMille, was called "China City" and was burnt down in the 1940's. More information can be found at Old Chinatown History. 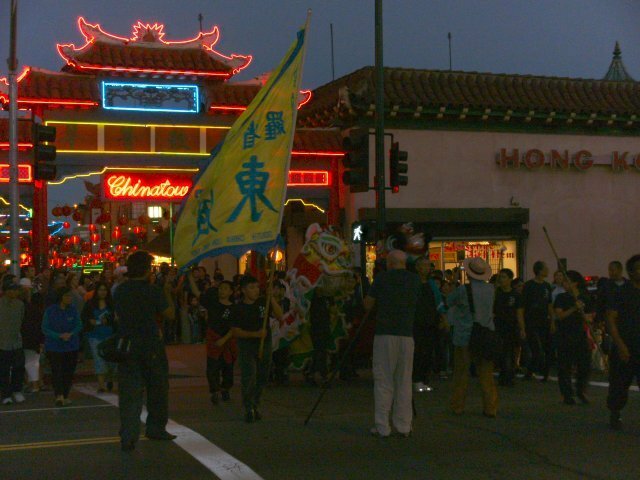 See Original 1899 Chinatown photo (Photo Credit-http://hiddenlosangeles.com). Additionally, you can read more Chinatown History from travel writer Bonnie Tsui's site American Chinatown, which was provided by Mike Truong of the Garnier Building (Chinese American Museum). The Garnier Building was built in 1890 and was part of the city's original Chinatown. The southern portion of the building was demolished in the 1950s to make way for the Hollywood Freeway. The Chinese American Museum is now located in the Garnier Building pictured below. Dance classes on Sun Mun Way. 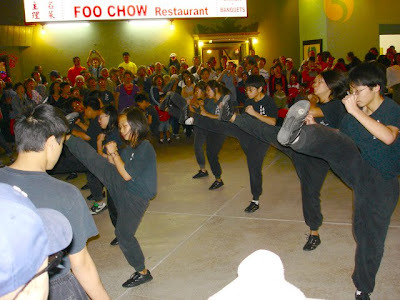 The Chinatown Kung Fu Lion Dance Troupe is a multi-generational, multi-ethnic, grassroots organization based in Chinatown Los Angeles, which practices lion dance and kung fu based on Southern Shaolin traditions, that formed in 2002. And now for the food adventure. We decided on Don Chow Tacos. 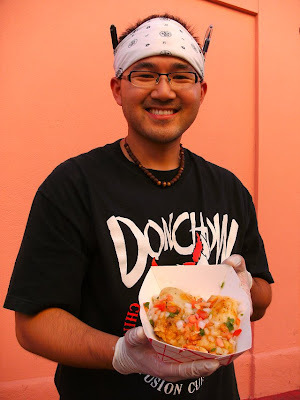 We meet with co owner Laurence Lig who is pictured below with our Kung Pao Chicken and Chinese BBQ Pork Chimales which are a Chinese-Mexican fusion Tamale. 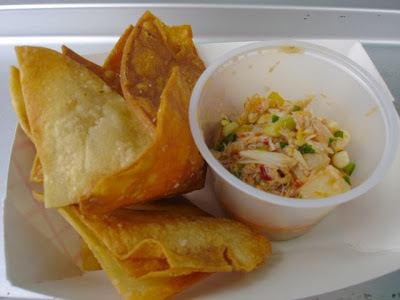 The Kung Pao Chicken Tamale remind me of a Peking style, but without the duck and it was amazing, bursting with delicous Asian flavors such as; hoisin sauce, rice wine vinegar, soy sauce, and sesame oil. The Chinese BBQ Pork was no disappointment as it was equally amazing in flavor and was kicked up Ragu style with a big punch! of heat to finish the gourmet tamale off with a Bang! Don't miss out on this great Gourmet food truck. Check out their Delicious Menu. Chimales: Hey Laurence hand them over bro! 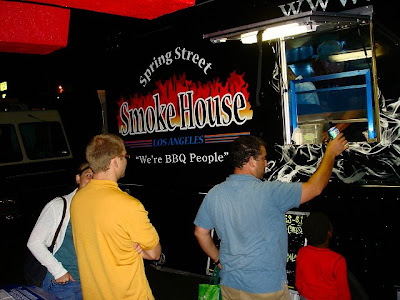 Our next stop on the way to gastric yumminess was Spring Street Smoke House a Texas style BBQ with a Carolina Twist. 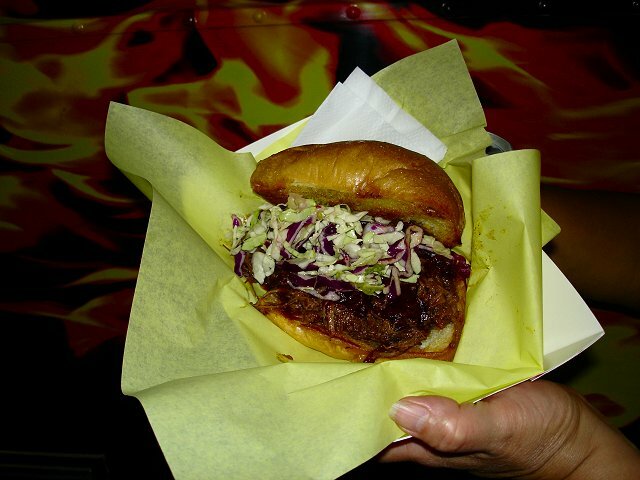 We had the BBQ Beef Brisket Sammie. The bread was soft and fresh, the meat was sweet and flavorful with a nice crunch from the slaw to finish up the end to a great event. Check out their Menu. BBQ Beef Brisket Sammie. Delish! 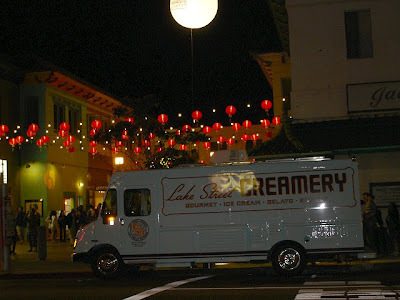 On our way out we decided on a little dessert fix at the Lake Street Creamery Gourmet Truck parked on Hill street. 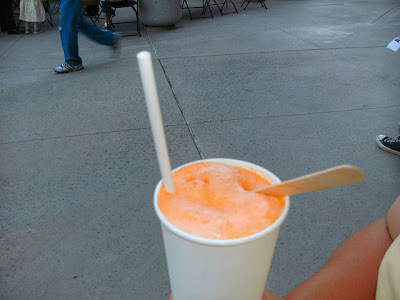 I had the Orange Blossom Float made with Boylan's Orange Cream cane sugar soda and there homemade California Zephyr Ice cream-Tahitian Vanilla, fresh Meyer lemon, and fresh bits of Mint leaves (Menu), which was a delightful end to an already great Chinatown Summer Nights experience. California Zephyr Ice cream in a waffle cone. Yum! !